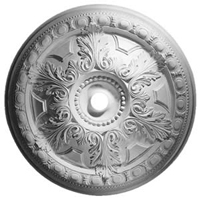 Whether you love the look of a truly “finished” fixture mounting, or you have a hole in the ceiling near the light you are hanging, a ceiling medallion is for you. Available in an unbelievable range of sizes and designs, there is a medallion to complement every décor and every fixture. We offer two other vendors whose catalogs are available in the showroom; alas, they have no websites!